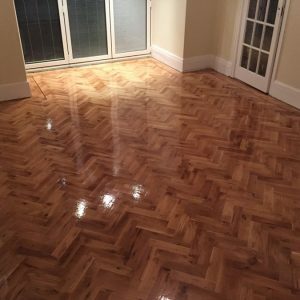 When deciding to have your floor sanded and refinished, it is vital to select the appropriate wood floor finishes and high quality product for the specific type of wood, colour and environment, in your home. There is no one product suitable for all floors. 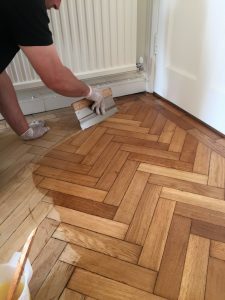 Our local manager nearest to you will be happy to offer FREE advice on which is the best choice of wood floor finish for your individual home. Choosing the correct finishing products will give you a beautiful, hard-wearing and long lasting finish. Using the incorrect wood floor finishes will deliver inferior results and a shortened lifespan. How you decide which finish to use, will depend upon various things. First, you need to decide what style of finish you like. For example, do you like a shiny look or do you prefer a more natural looking finish? Second, the finish you choose will have a lot to do with the traffic the floor is likely to experience. And finally, of course, there’s the maintenance question to be answered. How important is low maintenance to you? There are two main options when it comes to wood flooring finishes. Firstly there’s lacquer, which is a durable, low maintenance option but can be prone to scratching. Secondly, there’s oil which is slightly less durable but easier to repair if the floor starts to look a bit tired or scratched. Most lacquers, even matt lacquers give an appearance of an obvious coating to your floor, whereas oils sink in, enhancing the grain of the wood and giving a more natural look. The reason that lacquer looks more obvious is that it effectively sits on top of the wood, rather than sinking in. What this means is that lacquer has a tendency to become worn looking in high traffic areas. What happens is that the traffic effectively sands away the lacquer and leaves scratches on the surface. The only way to repair this damage is to re-sand the whole floor and start again. 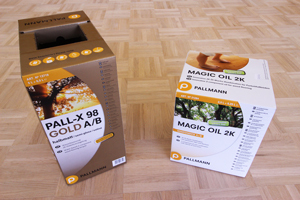 Wood floor oil has the advantage of having a low build up and comes in a low gloss finish, which helps mask slight imperfections caused by wear and tear. A wood floor finished with oil can be easily repaired at any time with a simple wipe of oil on a soft, dry, cotton cloth. Furthermore, extreme stains can be scoured away and re-oiled if necessary.